I'm joining the 2016 Finish-A-Long this year! I need motivation for all my sewing projects and this is perfect for me. Since I've been on here last, we have two new grand kids. Our son and DIL had a their 4th child, a daughter, Josie in March of 2014. They were so excited to have a daughter after having three boys. She is definitely the princess in the house. The boys are growing up so fast....ages 5, 8, and 10. Our daughter and SIL had their first baby two months ago. A baby girl named Hadley. They are great parents and she is so cute and sweet. I've made a handful of quilts since I last posted last and have made lots of window treatments for clients and our new home. Besides a few quilts and window treatments, I've been making zippered pouches. I've also enjoyed a few sewing retreats as well since I last posted. Sew South 2014 - Charlotte, NC, Stash Bash 2015 - Atlanta, GA and Glamp StitchAlot 2015. Ann Arbor, MI. 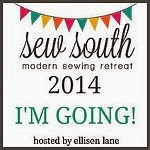 In April, I'm going to Sewtopia in Atlanta. 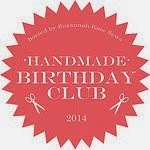 I'm so excited as one of my favorite fabric designers will be there teaching a class....Denyse Schmidt (DS). I am working on my third quilt that is using DS fabric. It is always so nice to see my quilt friends that I've made on IG, blogging, and previous retreats. This will be my first retreat where I don't know anyone that is signed up to go besides Amy Newbold who is the President of Sewtopia. If you are reading this and are going to Sewtopia this April, please let me know. **I joined the year long Farmers Wife 1930's Sampler Quilt Sew-Along back in September with my mom. I was on track until November and now I'm behind by 11 blocks from 2015 and 4 of the blocks that they've announced so far in 2016. I'm using DS fabrics in her prints and solids and am using a variety of low volume fabrics as well. My mom is on track and she is using 1930's reproduction fabrics. **I love Elvis and have loved him since the early 70's. I have collected Elvis t-shirts and Elvis fabric. My goal is to have this a Elvis t-shirt quilt pieced, quilted and bound by the end of the first quarter. This has been on my to do list for a few years and I'm determined to get this done and hung on my wall in my sewing room. **I need to make a commissioned throw quilt for a little girl. I've made her brother and her parents a quilt last year and her quilt is the last one to make. I get to pick out the fabric and the quilt pattern and I have to say that I'm a bit nervous. I don't have anything to show. So that is all I'm committing to for my first quarter. Linking to 2016 Finish-A-Long on Debbie's blog - A Quilter's Table! I started writing a blog post on Saturday that I was going to post on Sunday but my plans took a major turn around noon. The post was about our big move, the story behind our house and the opening of our pool. Yesterday my husband and I were taking the last load of stuff out of our old house and loading it on a trailer. While walking down the ramp on the trailer I slipped and fell on my ankle. My ankle has a spiral fracture and now I'm in a splint cast. Good news that I do not need surgery. Bad news is that I'm in a cast for 8 weeks. 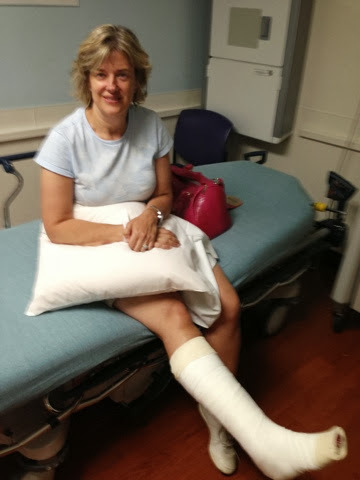 I should be in a walking cast in about 7 to 10 days. 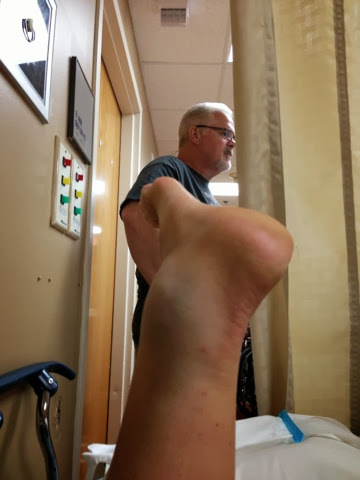 Isn't that the ugliest ankle you've ever seen! That is my sweet hubby talking to the nurse. My husband left today for a business trip to Hawaii for a quick 4 days so my mom is here helping me out. I had big plans for this week like opening sewing boxes and somewhat organizing my new sewing room. So for the ladies that I owe blocks to, I promise ill get them done. I hope I can still go to the Sewing Summit in September. After the horrific tornadoes in Oklahoma last month, my friend Di mentioned that she was making a quilt for the Oklahoma Modern Quilt Guild to for the quilt drive they put together. They are asking for quilts of any size, gently used or new. I was in the middle of making two quilts for Hands 2 Help and realized I could easily make a third quilt. This is the second time I've made this quilt using Denyse Schmidt fabric. This time around I did not rotate the blocks. If you need a super easy fast quilt, I really recommend this quilt pattern. I made two quilts this year for Hands2Help that Sarah over at Confessions of a Fabric Addict organizes each year. The first one is going to Happy Chemo and my second one is going to Quilts Beyond Borders. I came across this super easy and very fast pattern "Happy Blocks" from Adrianne at Little Blue Bell. 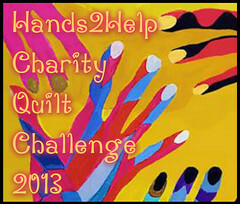 This is my 3rd year making a quilt for Hands 2 Help coordinated by Sarah over at Confessions of a Fabric Addict. I'm donating two this year, one for each of the organizations that Sarah has picked for 2013. As soon as I signed up in March, I knew I wanted to use charms that I have collected from all the charm swaps that I have participated in. I searched all my patterns and books and found the perfect pattern in my new book that I bought on Amazon. 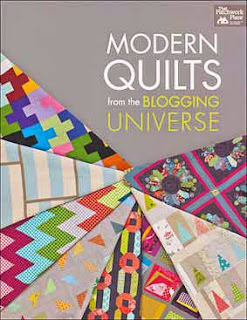 I love this book and have planned 3 different quilts from this book. If you don't have it, this is a must have book to own. I love to buy books that have quilts that have been made from people that I know or have met. Here is my version of the above quilt that I am made. I'll be sending this quilt to Emily who organizes Happy Chemo. Happy Chemo is an organization that provides quilts and comfort for chemo patients. They also collect up and provide information about freebies and discounts that may be of use to chemo patients. Emily has been championing this cause for a while, and has set a goal of providing 1500 quilts to Happy Chemo. She’s already donated nearly 600 quilts. 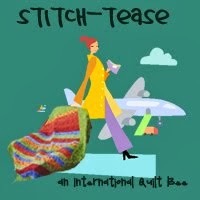 I'll be posting in a few days the second quilt that I'm donating as soon as my mom finishes the binding. Yes, my mom loves to do all my binding. Last year I was part of the Neutral or Not Bee. When all of the granny square quilts were popping up all over the web, I knew that would be the perfect block for my bee pals to make. When it came time for my month, I shipped out assorted Denyse Schmidt fabric for all of them to make me the Granny Square block. Thank you to my Neutral or Not Bee group and my mom who so kindly made the additional blocks to get me to 25 blocks. I haven't kept a quilt that I've made in a few years, so this quilt is staying home!